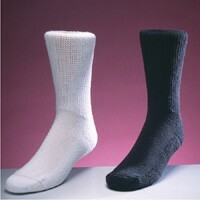 High quality comfortable diabetic sock made of comfortable natural anti-microbial cotton and spandex for comfort and fit. Flat toe seam for a no seam feel, with gentle banded top for no slip comfortable wear. Available in Men's and Women's sizes in white or black. Please specify your choices below when ordering.